Ayurveda recognizes that each human being is born with a unique balance and that this natural balance is responsible for physical, mental, and emotional well-being. By recognizing and maintaining this unique balance, Ayurveda provides simple guidelines to help each person create his or her own state of ideal health. For now, we will discuss the fiery nature of Pitta. The first thing which comes to mind when thinking of pitta is the brilliant blaze of fire. The primary function of pitta is transformation and controls digestion, metabolism, and energy production. The primary site of pitta dosha is located within the small intestine. During the initial stage of pitta imbalance the ‘liquid & sour’ qualities begins to accumulate which may create conditions of periumbilical discomfort/pain along with developing a yellowish tinge in the eyes. Excess liquid quality of pitta can impair the digestive capacity [i.e. Agni] which can lead to acid indigestion/heartburn. Generally, the ingestion of certain tastes such as sour, salty, and pungent can increase pitta dosha. If there is excessive liquid & sour qualities of pitta then one may want to consider avoiding hydrophillic foods such as yogurt, salty foods, and even avoid fruits such as apricots and grafefruit. 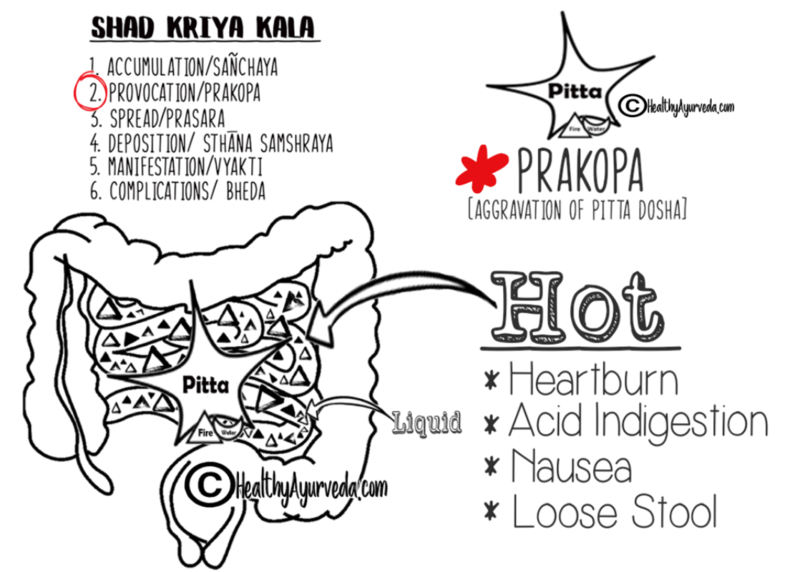 As pitta dosha continues to become further imbalanced with liquid/sour and hot qualities pitta soon becomes aggravated primarily in the small intestine with symptoms of indigestion along with the above-mentioned symptoms of periumbilical discomfort/pain, etc. Food which is heating such as beef, chicken, goat, fish along with certain oils [i.e. sesame, olive, almond], curds [yogurt], buttermilk, liquor/wine, sour/citric fruits [i.e. oranges], and certain spices [i.e. cayenne pepper, chilies, mustard] … are all … “heating” … which can further aggravate pitta dosha. As pitta dosha increases and begins to become further aggravated in the small intestine [primary site], pitta also begins to increase in the secondary sites which may begin creating certain signs and symptoms associated with pitta dosha. As vata dosha continues to become further imbalanced the oily quality now allows pitta to spread from the gastrointestinal tract into the general circulation. The liquid/sour, hot and oily qualities of pitta can affect blood tissue [rasa/rakta dhatu] which can create signs and symptoms of fever, hives, rash, urticaria, and other skin conditions such as eczema … since skin is the by-product of blood [rasa dhatu] according to Ayurveda. Often pitta types have a shiny complexion and this is due to the oily quality of pitta. However, this oily quality can make pitta types sensitive to oily foods which can aggravate conditions of the gallbladder. It’s interesting that bile, which is stored within the gallbladder, is considered a common element of pitta. If the oily quality of pitta is increased it’s thought to be a contributing factor for inflammatory gallbladder conditions [i.e. cholecystitis]. Individuals who have this excessive oily quality may want to consider the opposing dry quality. For example, individuals with persistent acne may want to consider topically applying chickpea flour, brahmī or camphor. This stage in the progression of pitta dosha is particularly significant because the sharp & penetrating qualities of pitta allows for the entry of pitta into weakened tissue [i.e. impaired dhatu agni]. If the integrity of each tissue is intact with optimal function [i.e. dhatu agni] – then pitta dosha will not be able to enter into tissue and will therefore return back to the gastrointestinal tract – where it belongs. Dhatus are similar to tissue. Dhatu comes from the word “dha” which means ‘to hold’. Therefore, dhatus are “that” – which hold certain functions; which is similar to our modern understanding of bodily tissue. We can think of dhatu agni as being the tissue’s protective barrier to disease. If this tissue barrier [dhatu agni] becomes impaired, this allows the qualities of pitta dosha to enter the tissue and begin to create clinical signs and symptoms of disease. During this stage of the disease process [i.e. vyakti] the qualities of pitta predominates, overcomes the qualities of the tissue/dhatu and now the full manifestation of disease occurs. Impaired Rasa Dhatu allows for the qualities of pitta to enter into rasa dhatu [plasma] creating symptoms of fever with chills [pitta jvara], rash, acne, melanoma, moles, etc. Impaired Rakta Dhatu allows pitta to enter rakta [blood] dhatu [rakta gata pitta] which may lead to rash, hives, urticaria, eczyema, psoriasis and even hot flashes. Impaired Mamsa Dhatu allows pitta to enter mamsa [muscle] dhatu [mamsa gata pitta] and create symptoms of abcess formation, boils, inflammatory myositis/fibromyositis/tendonitis. 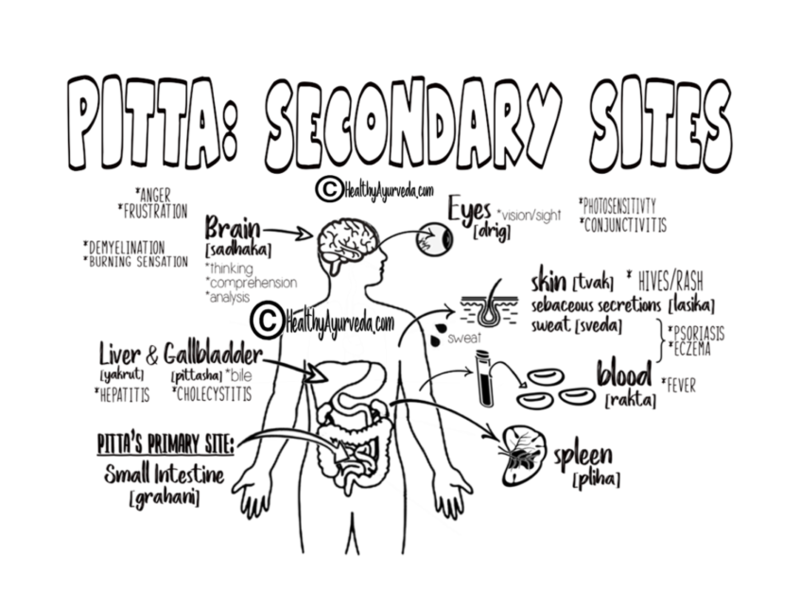 Impaired Meda Dhatu allows for pitta to enter meda [adipose] dhatu [meda gata pitta] which can lead to sensitivity to fatty/fried food, fatty diarrhea, gallbladder pain [cholecystitis]. Impaired Asthi Dhatu allows for pitta to enter into asthi [bone] dhatu [asthi gata pitta] which can create symptoms of inflammatory arthritis, osteomyelitis, tooth abcess, hair loss, etc. Impaired Majja Dhatu allows for pitta to enter into majja [nerve/bone marrow] tissue [majja gata pitta] and may create neurological symptoms of dizziness, nausea, vomiting, fever, meningitis, jealousy, anger, etc. Impaired Shukra/Artava Dhatu allows for pitta to enter into shukra/arthava [male & female reproductive dhatu and create symptoms of various male and female health concerns. In this final stage of the disease process, the fleshy quality of pitta leads to further complications creating foul-smelling tissue [i.e. abcess/gangrenous/pus] of the already weakened tissue. Here, the individual should seek immediate care of a qualified professional.